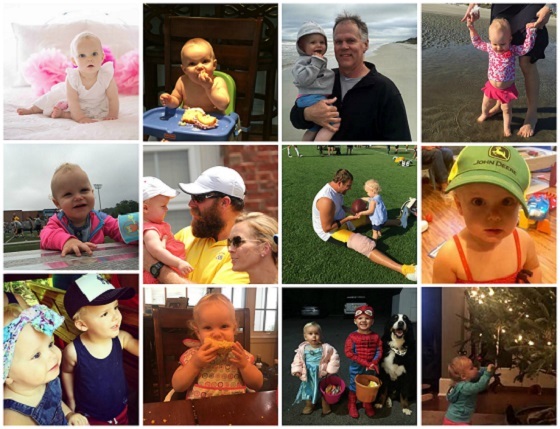 Today is Baylee’s 2nd birthday, but before we move ahead, she wants to look back at the fun year she had! I enjoyed my first birthday party, and mommy got me to sit just long enough for something called a “portrait”. The cake-eating part was my most favorite, of course. In the Spring, my daddy took our whole family to the beach – boy, did we have fun!! Summer came and so did Daddy’s football camp – gosh, there were SO many kids! It was so cool!! Benjamin, Mommy and I also went to Daddy’s golf tourney. I was all over the place until my Uncle Brett got ahold of me! I could hide my toys IN THAT BEARD!! We visited Daddy at Steelers training camp in August, and Mommy took me and Benjamin to Idlewild Park. Oh! I almost forgot! I also got to eat corn-on-the-cob like a grown up! Yup, it was left on the cob, and it was gooood! Then it was my favorite time of year – Halloween! That was followed by my other favorite time of year – Christmas. I’m a big girl now, so I got to help Mommy & Daddy and Benjamin with the ornaments on our tree, it was so pretty!! Did you see my awesome golfing skills? I may end up in the LPGA some day! And check me out on Christmas Day! I was a pop star! I wrote my own lyrics too! I’m pretty sure my song, “Go Bay Bay Go” is going to be a hit single some day! My brother did the guest vocals. What have I been doing since the off-season started? Geez, where do I begin? We got to play in a lot of snow this winter – a lot of snow means a lot of fun! 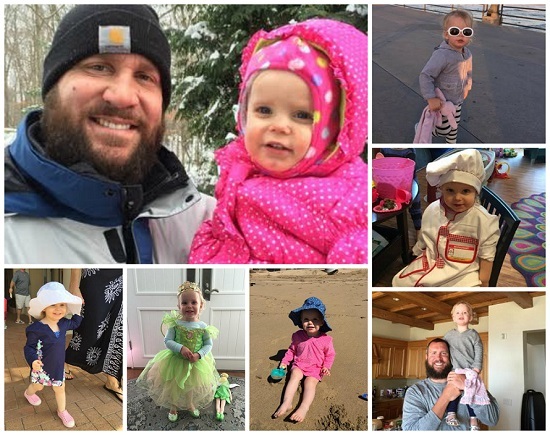 But I’ve had enough of winter so I’ve been doing a lot of traveling lately….been doin’ some baking, playing “fashion show”, dressing up in my costumes, building sand castles, and just hangin’ out with my dad, my mom and my big brother — and it’s only March!! Whew! It sure was a busy year. But don’t relax too much, you guys need to keep up with me again this year!! — Baylee.